With school in full swing, I am all over breaking out my crock pot more often. Between homework and sports starting, mama just doesn’t have much time in the kitchen these days! I love the thought of starting dinner in the morning then having it ready when the kids get home from school. Raw chicken is a bit unpleasant to look at, so lets move quickly, lol! 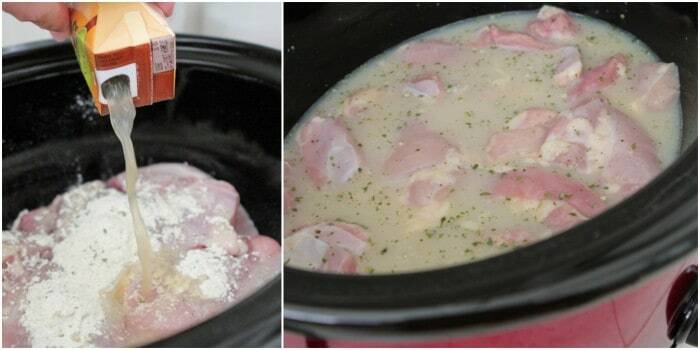 Place your chicken into your favorite crock pot. Season with one packet of Ranch Dressing Seasoning. I found this organic one at Whole Foods. Time for the chicken broth. A little stone ground mustard up next. Honey time. This is such a great dinner. You’ll love this one! 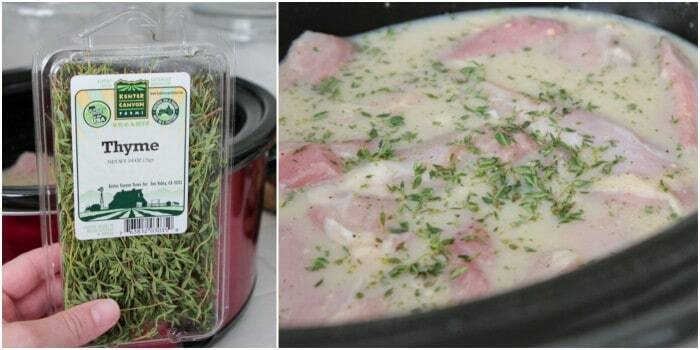 Add a few tablespoons of fresh thyme, then let the crock pot do all of the work. Love! 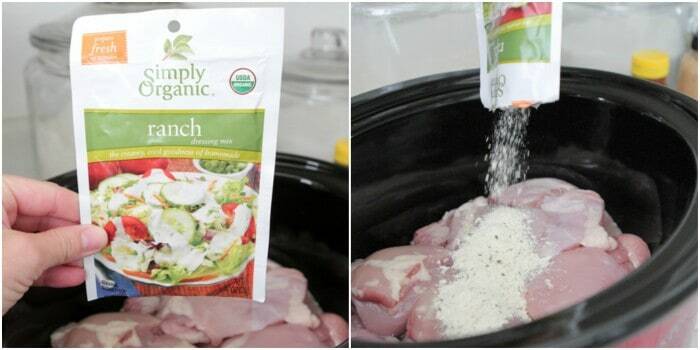 Place chicken into crock pot. Sprinkle Ranch seasoning over chicken along with mustard, honey, chicken broth and thyme. Stir with spoon, cover lid and let cook on low for 6-8 hours or on high for 4-5 hours. 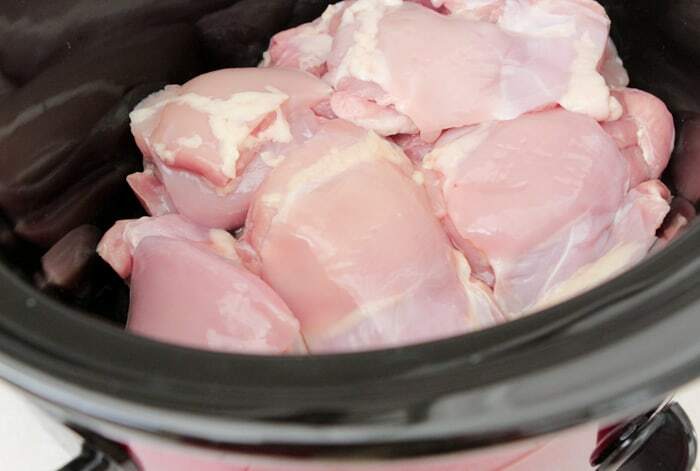 Remove chicken from crock pot and strain broth through a fine sieve to remove fats. Place chicken and broth back into crock pot. Add 2 more tablespoons of mustard and 2 more tablespoons of honey. Stir and season with salt and pepper to taste. Cook pasta according to package directions. Drain. Heat oil and garlic in a large pot over medium heat. Add pasta, stirring to combine. Season with garlic salt. 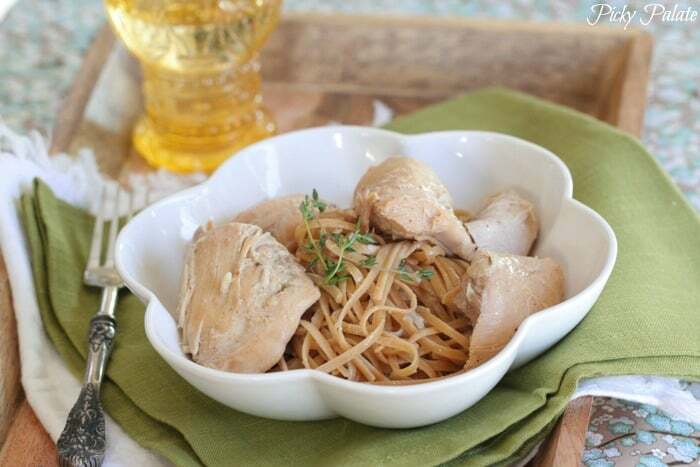 To serve, place pasta on a plate then top with chicken. Spoon broth/sauce over top. That looks yummy! 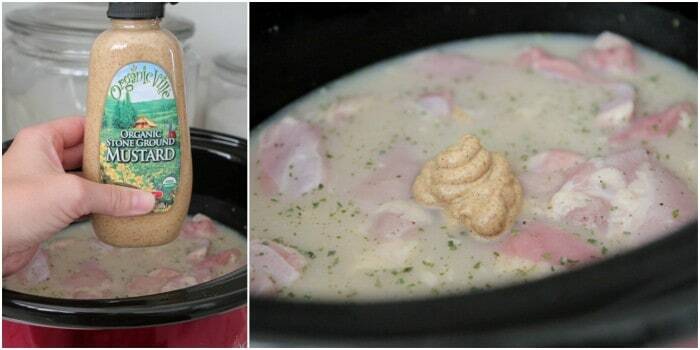 I love simple and delicious crock pot meals! I just did a Honey Sesame Chicken. And having only to clean up one pot afterwards isn’t bad either! Crockpot meals rule!! 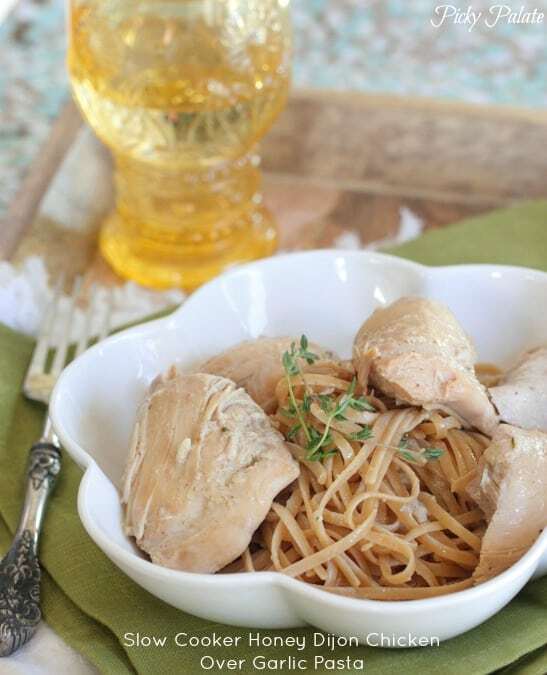 This is something everyone in the family would love and so easy for weeknights! YA! Looks like total comfort food! Love! I’m still scared of using my slow cooker but this recipe looks so easy and delicious, will give it a shot! Looks delicious! Great weeknight meal! Love a good slowcooker meal, thanks for sharing! So simple and yet full of flavour! This looks delicious, Jenny! My slow cooker and I are the best of friends. I know my family would love this! As soon as September 1 hits, it means fall, which means slow cookers and sweaters – I am so in heart with this Jenny! 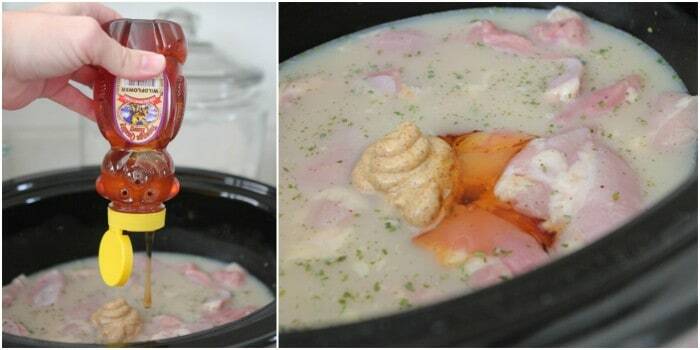 I love fall aka “crock pot season!” I can’t wait to give this recipe a try. Thanks for sharing. You are seriously the queen of slow cookers! And I like it. I love anything with a crockpot involved, yum! Crockpot – YES! I’m all about that and this recipe. Love how easy it is. Oh, YUM!!!! I am LOVING crock pot meals right now!! You are a saving grace when it comes to slow cooker recipes! I adore anything with Dijon! Can’t wait to try! Mmm, I can almost taste how good this is just by looking at it! Just wanted to say thanks for sharing this recipe! I made it yesterday and both my husband and I absolutely loved it! Honestly the best chicken recipe I’ve ever made. This will be a go-to for years to come! Thanks!!! Great recipe!! So easy and yummy!!! Love it!! A new fave for me!! I’m a new fan of your site!!! 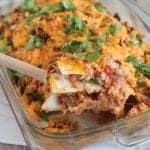 I’m new to crockpot cooking and this was great! Hi! 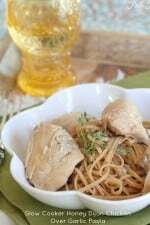 I’m new to your site and looking for easy, healthy dinners for my family. I also have a baby meal to make for a neighbor… do you think I could sub honey mustard for the honey+dijon mustard? I happen to have that on hand. Thanks!